ACL rehab protocols are designed to work through a graded return to exercise and activities to ensure that you make a full recovery after ACL surgery. ACL rehab is a slow process and it can take up to a year to return fully to sports but it is really important not to rush things. When an ACL rehab protocol is followed, the success rate of surgery is excellent with approximately 90% of patients returning to their pre-injury activity levels. Most of the problems associated with reconstruction surgery comes either from a poorly designed rehab programme, or failure to comply with the programme. 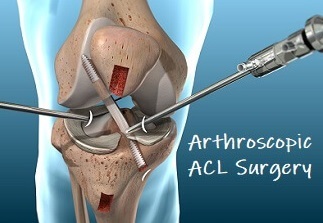 You can find out more about the indications for surgery in the ACL surgery overview. During surgery, the ACL is replaced with a new graft, fashioned either from the patella tendon, hamstring tendon or donor tissue. Surgery is usually done arthroscopically (keyhole surgery). An ACL rehab protocol is split into 5 phases of recovery, each targeting different areas of rehab and recovery. ACL surgery rehab will vary slightly depending on the graft that was used, the surgeon’s technique and whether there was any associated damage at the time of injury. Some surgeons will want you to wear a knee brace for a while, others will limit the amount of flexion at your knee initially. Here, you will find a guide to some of the most commonly used ACL rehab exercises and drills used during the different phases of the recovery from an ACL reconstruction. But remember, this is a guide. 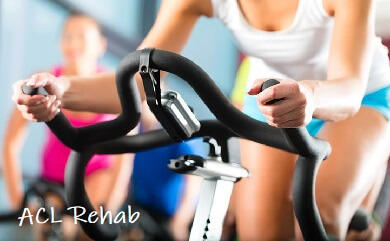 Always check with your doctor or physical therapist before starting any new exercises or progressing on to the next phase of rehab. Starting Position: Lie on your back with your legs up on a wall or closed door. Starting Position: Stand leaning against a wall, feet apart and a few inches away from the, toes pointing forwards. Progression: Perform a bridge and then straighten one leg out, without dropping your hips. Hold for 5-10 seconds and then lower. Repeat on the other side. Retraining balance and proprioception is really important in this phase of an ACL rehab protocol. The simplest way to start is to practice standing on one leg. Sounds simple, but see how long you can balance for, comparing your operated and non-operated side. It can help to keep a record to see how you are progressing. c) Close your eyes: much harder than it sounds! Phase 3 of the ACL rehab protocol is the time to be extra careful, as the new graft is at its weakest in this phase. Before progressing to phase 3, you should have regained full range of movement, both flexion and extension and there should be no swelling. Starting Position: Stand on the operated leg, holding something for balance e.g. table or wall. Now, you are aiming to make balance an unconscious phenomenon – your body needs to learn how to balance and make the necessary adjustments without you having to think about it – that is what proprioception is all about. a) Standing on a wobble board/balance board: there is no end to the activities you can do on these e.g. throwing and catching, one leg standing, small squats etc. 3) Jogging: Start by running at about 40% normal pace, only in a straight line. 2) Stop and Go activities: Jogging a few paces then stopping, then setting off again (thus practising quick acceleration and deceleration activities). Again this should be multi-directional. 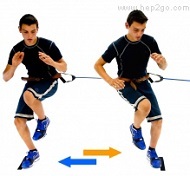 By this stage, ACL rehab protocol really depends on what you are wanting to get back to. You will continue to work on strength, power, endurance and proprioception work but it will be tailored to the sports you are planning to return to. It is essential that you follow the advice of your physio and aren’t tempted to return to sports before you’ve been given the green light. An ACL rehab protocol may seem long, arduous and restrictive, but it is designed to ensure the new graft is protected and that you regain full strength and stability of your knee so that you can make a full recovery.